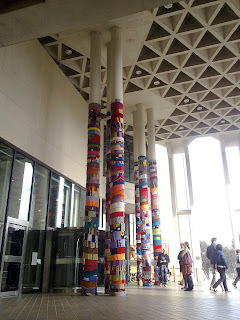 Becclebee of Marjoryjane went to the National Gallery in Canberra this weekend and wandered around an exhibition of Knitta Please. Knitta Please, for those of you who haven’t come across them before, are a group of American crafty guys who looked in dispare at all their unfinished knitting projects laying around and wondered if there wasn’t a good thing they could do with them. So they went out late at night and started sewing them around trees, to door handles, around street signs and public art, anywhere they could find. How incredible is that work? If you click on it to see it bigger, you’ll see that each stripe is about scarf width. Mind boggling amount of knitting, even if they did knit in on a machine. It’s awe inspiring! Previous post: Oh, surprises are so hard to sit on!